There are many great Escrow Companies to serve you today with your escrow needs when purchasing your new home. EscrowOne, Inc. takes its role very serious when it comes to protecting you and your assets. Fraud is on the rise in today’s world and in the Escrow industry. Escrow Fraud is a ploy that involves a scam artist posing as your Escrow Company or setting up a fake escrow companies and ripping off the customers. This deception has been around in some form or another for as long as escrow companies existed. Although we are blessed with the gift of technology and internet banking to speed up our process, we are much more vulnerable to the escrow scam artists like never before. The Internet makes it easy to create a fake company, and it allows fraudulent scammers to violate millions of escrow clients without much effort. 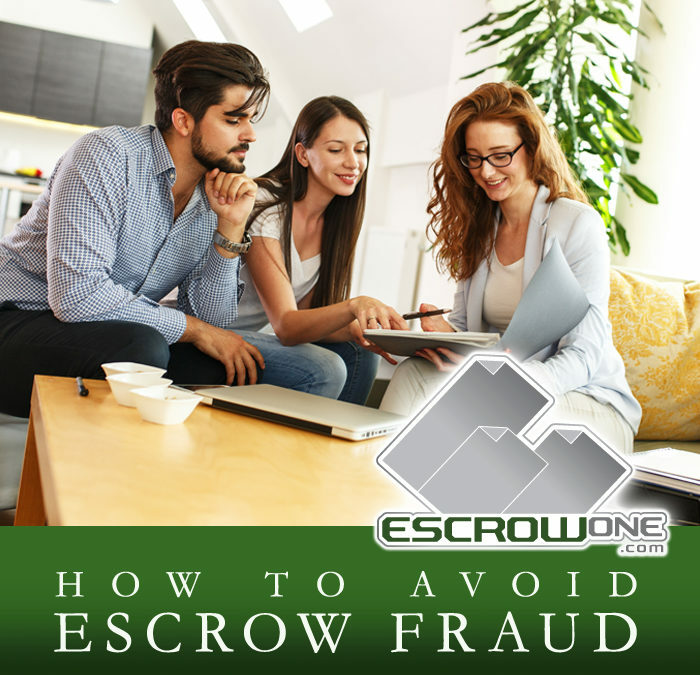 You can avoid becoming a victim of escrow fraud if you stay in close contact with your EscrowOne, Inc. Escrow Officer. A huge Red Flag is when they ask you to send your Money early. EscrowOne, Inc. would like to inform you and requests that you watch out for the indicators below. In many cases, the con artists will simulate the Escrow Companies websites to make their scam look legitimate. NOTE: Escrow Companies will never contact you through their web site for an escrow transaction or file. Watch emails received from your Escrow Company/Escrow Officer. They may copy a logo, but watch to see that the entire email is in the same format, such as the company’s original name, the copied web pages may contain broken links, etc. If they copy the website’s coding, they may wind up creating websites/emails with oddly spaced paragraphs, coding instead of images, and otherwise broken layouts. Be sure the companies correct legal disclaimer is added after the signature line with correct name, title and contact information. Lastly, and most important check the email address you are receiving an email from. I may be altered. Legitimate escrow companies will have customer service workers and/or Escrow Assistants that will be able to respond to you directly during working hours. You should be familiar with your Escrowone, Inc. employees and know that only they will assist you. You might get put on hold for a while, but sooner than later, you will receive the help you need. Con artists, on the other hand, don’t always have the resources to pull this off and you may have never worked or heard of them before. If you call their customer service number you will wind up getting an answering machine. In some cases, you may not get anything at all. Either way, this is a clear sign that you’re dealing with a scam. If you are in question, search your web browser for our company web site and phone contact directly on your own. When a legitimate escrow company takes your money, it will be requested directly from your Escrow Officer, possibly in a secured email, who will ask you to wire the money to the Escrow Company’s Escrow Trust Account and give you the appropriate wire information. The scam artists will want to avoid that. Putting money in the bank leaves a paper trail, and many of them have criminal history that prevents them from claiming it, so they will request it be sent to some sort of trusted intermediary. Alternatively, the scam artists may ask you to send the money through Western Union of MoneyGram, hoping that you wouldn’t realize that both companies only send money from person to person. No Escrow Company or Lender will accept Western Union or Money Grams. Always call your original Escrow Company’s phone number/contact that you received from your real estate agent in the beginning of your transaction, to verify the instructions came from them. Do not call the number received in the email or web site telling you to wire, as it will call the fraud perpetrator you are contacting. The best way to find out if an escrow company is legitimate is to look it up with your state’s Attorney General’s office or the Department of Business Oversight in California. EscrowOne, Inc. is registered, regulated and does business under the Department of business Oversight. They are responsible for issuing licenses to all state businesses, including escrow companies. If the office has no record of the license, or if the details of the contact/correspondence information the escrow company gave you doesn’t match, you are dealing with a scam. Please contact your EscrowOne, Inc. office near you for more information.